Feature Article: Transdisciplinary Axiology: To Be or Not to Be? Transdisciplinarity (TD) is fast becoming a global philosophical movement. This paper is concerned with transdisciplinary axiology, especially with the ongoing conversation aboutwhether or not this particular axiom (pillar) is needed in conjunction with the three other transdisciplinary axioms: epistemology, logic and ontology. After providing an overview of the concepts of axioms and axiology (regardless of which methodology is in question), the paper elaborates on transdisciplinary axiology as an emerging concept, addresses the role of values in transdisciplinary work (guided by transdisciplinary methodology) and examines whether this work warrants a transdisciplinary axiology. There is an important conceptual distinction between the tools of scientific investigation (research methods) and the principles that determine how such tools are deployed and interpreted (research methodologies). There are three well-known research methodologies: empirical, interpretive and critical (with connections to positivism/post-positivism, qualitative/qualitative). Nicolescu (2010a) suggests that transdisciplinarity is a fourth methodology. Four branches of philosophy pertain to research methodologies, and distinguish one from the other. Metaphysics, including ontology, studies the nature of reality (being and becoming). Epistemology is concerned with the nature and scope of knowledge (what counts as knowledge and knowing). Logic involves the study of valid argument forms, the habits of the mind that are acceptable for inference and reasoning when arguing one’s position on an issue. And, axiology is concerned with the role of values and of the researcher in the generation of new knowledge (value and valuing) (McGregor & Murnane, 2010; Ryan & Cooper, 2007). Taken together, these four pillars of research (knowledge, logic, reality and values) are called axioms, self-evident rules, principles and laws. Axiom is Greek axioma, that which is worthy, has authority, is estimable, is weighty (Cicovacki, 2004; Harper, 2010). “Greek philosophers believed that an axiom is a claim that is true, without any need for proof. The truth of an axiom is taken for granted” (McGregor & Murnane, 2010, p. 420). To illustrate, if people accept that knowledge is out there waiting to be discovered (epistemology) using the value neutral scientific method (axiology) and deductive logic leading to reliable descriptions of single reality (ontology) (i.e., the empirical methodology), they will not question the validity of the truth generated using this approach to research. The scientific community as a whole has tended to engage in value-neutral work, neglecting to recognize and respect axiology as a science (Bahm, 1993). This narrow approach to research is shortsighted since epistemological and ontological choices (what counts as knowledge and reality) habitually involve aspects of axiology (values, ethics and morals) Engle, 2009). Although many types of sciences involve values in their inquiries (e.g., psychology andhistory), and there are various types of value sciences (e.g., aesthetics, ethics and religion), axiology as a value science stands alone because the other sciences depend upon it (Bahm, 1993). Traditionally, existence (ontology) and knowledge (epistemology) were not tied to axiology (value) while morality and practice were, explaining why science evolved along two different trajectories: value free and value laden (Bazewicz, 2000; Giuculescu, 1998). Only recently have the interpretive and critical research methodologies focused on the role of values and researchers in the research process, paving the way for a legitimate concern for axiology, the science of values (McGregor & Murnane, 2010). Axiology stems from two Greek words, axios (worth) and logos (theory) (Hart, 1971); hence, it refers to the theory of values. Humankind’s quest for values is in fact a quest for things and events that are conducive to survival and to the enhancement of life. Inquiry into value judgements is a necessity of life itself (Hart). Axiology is the science of inquiry into human values. This inquiry enables people to identify the internal valuing systems that influence their perceptions, decisions and actions – to clearly understand, “What do I value? How do I value, and how do I make value decisions?” (Schoof, 1999). Values do not give people a sense of what is or what is not but of what isvaluable (able to have worth or merit) and what is not valuable (Cicovacki, 2004). Axiology is the science of people’s choice of basic fundamental values (Engle, 2009). It is a science that brings order to everyday moral decisions and value judgements – to people’s value world (Hartman, 1967). Axiology tells people what to pay attention to, what is important to them, and it helps clarify their prejudices and biases. It measures how people think and perceive things rather than what they are thinking (Hartman, 1967; Schoof, 1999). “Natural science explains human behaviour. [The science of] axiology explains and measures the thinking [the valuing] that forms the foundation for, and leads to, human behaviour (Schoof, p. 3). Within philosophy, axiology refers to the study of values, namely two kinds of values: ethics (good and bad) and aesthetics (beauty and harmony). Within ethics, value is the property of something or an action, reflective of its importance (Hart, 1971; Schroeder, 2008). Values form the backdrop against people’s thinking, beliefs and perceptions; values underpin relationships and are invaluable, priceless and of deep importance to transdisciplinary work. People’s values, spelt out or not, are embedded in everything they do, write, say, perform and create (Tella, 2005). Values profoundly inform people’s behaviour and their (in)actions. Not surprisingly, axiology (the study of values and value judgements) is intended to link thinking (valuing) with action (Giuculescu, 1998). Hofkirchner (2003) equates axiology (envisioning a better world) with ethics and responsible activism, deeply influenced by values. Transdisciplinary work, back dropped by values, is intended to address the complex, wicked problems facing humanity (e.g., climate change, unsustainability, poverty) (Tella, 2005). Hofkirchner (2003) explains that these problems have their cause in social-political-technological developments. To address these problems, people need to bring science, politics and technology together (interconnect them) with society in a way that respects the survival of humanity in a future that is worth living. These types of connections necessitate a focus on values that informs the interactions among various disciplines, governments, industries, non-government agencies and citizens at the interface of transformative dialogues. Funtowicz and Ravetz (2008) argue that the host of urgent problems faced by the world cannot be adequately dealt with using routine expertise and professional knowledge and judgments, sans values. Lack of attention to value premises compromises people’s ability to determine the deep, underlying causes of the world’s crises, to understand these crises and, most significantly, to overcome them (Bahm, 1993). van Breda (2007) refers to a polycrisis, a situation where there is no one, single big problem—only a series of overlapping, interconnected problems. In a polycrisis, there are inter-retroactions (reciprocal actions) between different problems, crises and threats. This complexity infers the need for more than a single expert’s solution; however, interactions between multiple actors as they problem solve a polycrisis will give rise to value conflicts and contradictions. And, conflict will occur. People’s uniqueness and individuality means they may not be able to reach shared or common decisions. This lack of agreement also happens when people’s problems and priorities are different, or when, because of motivations, they emphasize different aspects of the same thing. In short, they value different things (Schoof, 1999). Engle (2009) comments that simply because people adopt different values, does not mean there are no values; rather, there are confrontational values (Hartman, 1967). The failure to correctly resolve difficult social problems demonstrates that values can only be truly known through practical experiences in the world. Society runs the risk of bad decisions if the world of values (axiology) is not taken into account, and if value conflicts cannot be resolved. Given the polycrisis we now face, we cannot risk too many bad decisions, nor persistent conflict. People need to be able to respect the value of the differences between themselves, and build on those insights. Hartman (1967) suggests that problem solving can be augmented if, through axiological analysis, the unique patterns of each person are observed and then compared to those patterns of others, and then integrated into the problem solving process. This way, value differences can be scaffolded and conflicts defused. Solving complex problems depends on many different knowledges and understandings functioning in dialogue with each other as actors continually explore the existing and possible relationships between contending knowledges and perspectives. Through dialogue, boundaries are dissolved thereby opening up axiology (values, ethics and morals) and other axioms (reality, logic and knowledge) to reconstruction (Hunsinger, 2008). We have to redefine and articulate tomorrow’s values and reflect on the directions in which these values may lead humanity (Bindé, 2004). 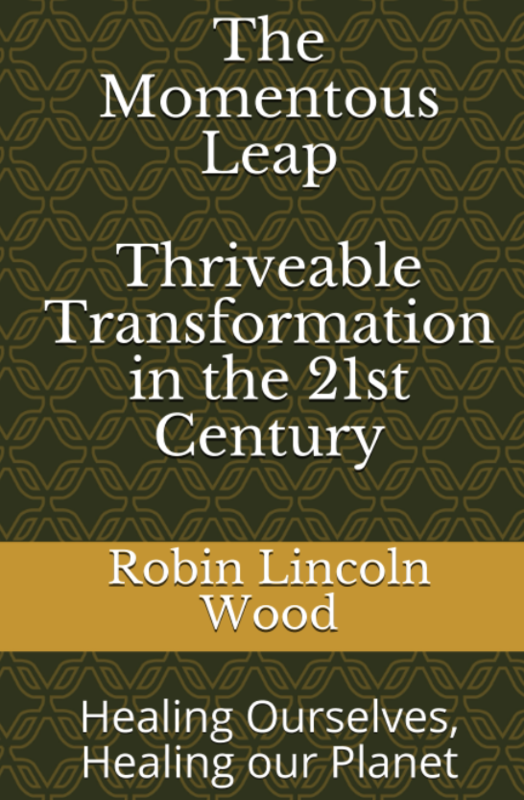 Transdisciplinarity emerged as an approach to solving the deeply complex, interconnected problems of the world in the early seventies, when people discovered that multi- andinterdisciplinarity were not enough. Problems were becoming too complex to be solved from within the boundaries of one discipline or using the conventional empirical methodology. There currently are two fundamental approaches to transdisciplinarity (McGregor & Volckmann, 2011). One views it as an “exclusive concentration on joint problem-solving of problems pertaining to the science-technology-society triad. This approach is represented by figures like Michael Gibbons and Helga Notwotny. This notion of transdisciplinarity was largely expressed at the Zurich Congress, held in the year 2000 [and rejects the notion of a transdisciplinary methodology]” (Nicolescu, 2010b, p. 22). The other influential approach to transdisciplinarity views it as a methodology in its own right, in addition to empirical, interpretive and critical methodologies. This notion of transdisciplinarity originated at the first world congress on transdisciplinarity (cf. Nicolescu, 2002), held in 1994 in Portugal. The main pioneer and champion of TD as a methodology is Professor Dr. Basarab Nicolescu, a Romanian quantum physicist based in Paris. Since 1994, he has developed the TD methodology in great detail, concluding that there is no need for a TD axiology. Unlike the old Newtonian sciences, TD methodology is deeply informed by the new sciences of quantum physics, chaos theory, and living systems theory (Nicolescu, 2006b, see also McGregor, 2011). Nicolescu believes that the innovations of the new sciences radically change what is acceptable as knowledge, reality, logic and the role of values. To that end, grounded in the new sciences, Nicolescu tendered his own interpretation of three pillars (axioms) of a transdisciplinary methodology: (a) ontology—multiple Levels of Reality and the Hidden Third, (b) the Logic of the Included Middle, and (c) epistemology – knowledge as an emergent complexity (Nicolescu, 1985, 2002, 2005, 2006a,b, 2007, 2008). He confirms these three axioms (ontology, logic and epistemology) have remained unchanged for science since the days of Galileo (the 16th century). Despite that all major research methodologies also contain the axiology axiom, dealing with values, ethics, morality and aesthetics, Nicolescu ardently believes “there is no need to introduce values as a 4th axiom” (2006b, p. 154). In more detail, he believes “we have to limit the number of axioms (or principles or pillars) to a minimum number. Any axiom which can be derived from the already postulated ones, has to be rejected” (Nicolescu, 2010a, p.3). Because transdisciplinary values “result from the Hidden Third [ontology]” (2006b, p. 154), he rejects the need for a fourth axiom, axiology. He explains, “There is no need for a 4th axiom of TD concerning values. From my point of view, the flux of information and the flux of consciousness, traversing not only the levels of Reality of the Object and the levels of Reality of the Subject butalso the region of the Hidden Third [zone of non-resistance], necessarily engender values” (personal communication, Basarab Nicolescu, June 10, 2010). As an aside, Nicolescu (2006b) posits there are Multiple Levels of Reality (at least 10) organized along three macro levels: Internal (consciousness, Subject), External (information, Object) and the Hidden Third, the mediated interface between internal and external realities (back and forth flow of information and consciousness/perspectives) (see Figure 1, used with permission). The Hidden Third construct represents the idea that it is essential to seek multiple perspectives on human problems if we are to integrate many levels of truth and value premises and perspectives while generating new knowledge. In this mediated space, the Hidden Third, people shed their resistance to truth informed by other realities and join these realities to generate complex TD knowledge. The Hidden Third construct represents people moving through a zone of non-resistance, a place where people become open to other perspectives, ideologies, value premises and belief systems, inherently letting go of aspects of how they currently know the world (see McGregor, 2011). A is not non-A; and, (c) the axiom of the excluded middle, meaning there is no third term T, which is simultaneously A and non-A. The mind (consciousness) and the body (object) are separate (Nicolescu, 2007). Rejecting this claim, Nicolescu drew on quantum physics and proposed a change to the third classical linear logic axiom, submitting that a third term T does exist, which is simultaneously A and non-A (also see Brenner, 2007 and Figure 1). The Hidden Third mediates the flow of information with the simultaneous flow of consciousness such that divergent minds can connect and share information and perspectives (including value premises) so as to solve complex, emergent problems. The emergence of a temporary new T state (both A and non-A) represents the emergence of new insights and perceptions (and according to Nicolescu (2006b), T values), made possible because of the temporary reconciliation of any contradictions or antagonism between A and non-A (Brenner, 2007; Cole, 2006). These T-values are neither objective (devoid of personal feelings) or subjective (modified by individual bias); rather, when the flow of consciousness and perceptions and information meet, in the zone of non-resistance, new things emerge, including Tvalues. When he describes transdisciplinary experts, Nicolescu characterizes them as people who are “socially attached to transdisciplinary values” (p. 157), but he does not provide any examples of these T values. Nicolescu further believes that “each person possesses an innate, sacred, intangible coreof transcultural, transreligious, transpolitical and transnational values” (quoted in an interview byGiosan & Florian, 2002, p.3). He asserts that if this innate transdisciplinary attitude remains only potential, forever hidden due to a lack of dialogue, transdisciplinary action cannot happen. Also, he believes these transvalues (term coined by this author) are “engraved in the very depths of our being” with the trans designating the opening of all cultures, religions, politics and values to “what cuts through them and transcends them” (Giosan & Florian, p. 5). To reiterate, because Nicolescu (2010a) believes that values emerge or are engendered in the interactive region of the Hidden Third, he assumes an axiological component of transdisciplinarity is not necessary; instead, values are derived from knowledge generation (epistemology), logic and Multiple Levels of Reality (ontology). Cicovacki (2004, 2009) disagrees, arguing explicitly that “transdisciplinarity requires the forth pillar as well, a new transdisciplinary theory of values” (2004, p.1). He maintains that, “values provide an axis of orientation for our lives, for our attitudes and our deeds, for our decisions about what is right and wrong, valuable or not. Values also provide an authoritative voice based on which we can make proper choices concerning how to live our lives and further develop our humanity” (2009, p. 13). To make his case, Cicovacki (2004) references Nicolescu’s (1997, p. 2) assertion that transdisciplinarity “is a way of self-transformation, oriented towards the knowledge of self, the unity of knowledge, and the creation of a new art of living.” Cicovacki maintains this comment is an obvious reference to the value-aspect of transdisciplinarity. To be fair, Nicolescu does not eschew values in TRANSDISCIPLINARY work; he just maintains they are accommodated within the interactions amongst the three other axioms. Cicovacki’s (2004) assertion that we need a new theory of transdisciplinary values has some merit. There are very few references to transdisciplinary values in the literature (e.g., a June 2011 Google Scholar search, using the term “transdisciplinary values,” revealed 25 hits), and even fewer scholars define the concept when they use it. To illustrate, Stokols et al. (2003) use the term transdisciplinary values as a proxy for a commitment to collaborative values, explaining that they observed transdisciplinary behaviour in their TRANSDISCIPLINARY research center evidenced by the cultivation of transdisciplinary values. Morris (2007) identifies the potential of emphasizing a moral application of power with integral and transdisciplinary values. de Mello (2002) recognizes that the transdisciplinary learning process (internal and external) is permeated by transdisciplinary values. Nash (2008) makes a case for developing training kits to socialize people to the nuances of transdisciplinary work (to prevent slippage back to their disciplinary stances). He repeatedly says this training should help people develop essential transdisciplinary values. Glasser (2006) argues that because transdisciplinarity is concerned with consciousness (levels of reality), those embracing transdisciplinarity have to pay attention to axiology – what do people consider to be of value to them. 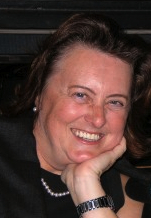 van Breda (2007) urges us to keep looking for agreement in the area of axiology, arguing that, in order to develop necessary tolerance of different viewpoints, so we can stay engaged in conversations about the complex problems shaping the human condition, we have to respect the role of axiology in transdisciplinarity. Bertea (2005) strongly affirms that an attempt to elaborate an axiology of transdisciplinarity is a high-level priority. Kamber, 2003). Indeed, by its very nature, transdisciplinary dialogue will witness the inescapable value loading of every inference, every opinion; every line of conversation will face a potential clash of values, ethics and morals. The transdisciplinary methodology is very politicized; hence, it is value laden, especially given its concern with structuring dialogue on pressing issues faced by humanity. People need to reconcile the different sorts of knowledge characteristic of the sciences in the academy with the knowledge and involvement of citizens (Funtowicz & Ravetz, 2008). This reconciliation may be better understood with a transdisciplinary axiology. Deeply respecting Nicolescu’s ardent belief that there is no need for a fourth TRANSDISCIPLINARY axiom for axiology, I feel compelled to think this through in more detail. Is it necessary to distinguish between divergent stakeholders’ values brought to a situation (their value schemas) and transdisciplinary values, per se? Are they one in the same? Is one the precursor of the other? Is one the catalyst for the other? Can they co-exist? Is one more privileged than the other? Is there a process of value emergence during Hidden Third dialogue that leads to unique transdisciplinary values that warrant a fourth axiom in order to investigate this process? McGregor (2009) coined the term integral value constellations as a possible name for the axiology axiom, using the words ‘integral’ and ‘constellation’ to reflect the holistic integration of a collection of original and changing values during complex problem solving. 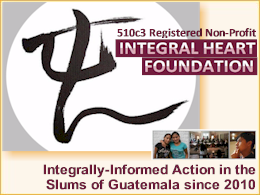 Integral is Latin integralis, forming a whole. Constellation is Latin constellatus representing “the position of planets (‘stars’) in regard to one another on a given day” (Harper, 2010). These Latin roots intimate shifting value positions over time, with the potential to converge into an integral collection of values that privilege transdisciplinary tenets, a new value whole. Wholes exert strong pressure on their parts and vice versa (Hofkirchner, 2003); by extension, transdisciplinary value wholes can be said to exert strong pressure on an individual’s value schema and vice versa. Consider Banathy and Jenlink’s (2004) notion that “how an entity becomes constitutes what that actual entity is… Its ‘being’ is constituted by its ‘becoming’” (p. 23). This premise infers we have to intellectually (theoretically) pay attention to how the merging of perspectivesand values happens during transdisciplinary problem solving, rather than presuming it is an inherent, natural occurrence. The process of value integration might indeed matter (the becoming) and may affect the emergence of transdisciplinary values (the being). On the other hand, ontology refers to being and becoming into reality, supporting Nicolescu’s idea that transdisciplinary values emerge in the region of the hidden third (a level of reality that mediates the interface between the other two levels of reality). Problem solving research and scholarship (like TRANSDISCIPLINARY complex problem solving) has to elaborate knowledge on two levels: factual (epistemological) and axiological (values) (Zierhofer & Burger, 2007). So, the question remains: Do we need a fourth pillar for transdisciplinary axiology or is Nicolescu right: transdisciplinary values are what matter (not individual’s value schema) and these TRANSDISCIPLINARY values emerge in the region of the Hidden Third, meaning there is no need for a fourth TRANSDISCIPLINARY pillar? I feel the answer is not clear. While Nicolescu asserts that the Hidden Third is the “source of our ultimate values” (as cited in Dincã, in press, p. 12), others respect the need to focus on the values various stakeholders bring to the situation and how the integration of these values is managed and led (called stakesharers by Torkar and McGregor, in press), and how this values integration process may be the catalyst for the emergence of transdisciplinary values. Does the Value Component of Transdisciplinary Work Warrant a TRANSDISCIPLINARY Axiology? 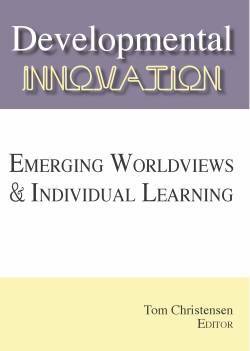 Within transdisciplinary problem solving of complex, emergent issues, thinking (valuing) and action are intricately bound, arguably leaving no room for the neglect of values or the assumption that they are engendered through other processes. Indeed, Bazewicz (2000) affirms that transdisciplinarity holds a holistic vision of the world, and is concerned with the local and global integration of the value hierarchy, appreciating that axiology deals with the nature of values and with methods of local and integrated reality. This holistic approach involves the process of signifying and valuing information and knowledge (with valuing meaning the determination or estimation of the worth of something). Hartman (1967) asserts that valuation is a natural, logical activity of the human mind. He claims each person has his or her own talent for valuing (value talent), developed to a greater or lesser extent. Hartman posits that everyone’s value talent is in motion, changing as situations change around them. His proposes three dimensions of value, which form the apex of anyone’s valuing process: (a) intrinsic value (personal or spiritual), (b) extrinsic value (practical or situational, and (c) systemic value (conceptual or theoretical constructs of the mind). In more detail, intrinsic values include empathy and self esteem; extrinsic values include role awareness and practical judgment/thinking; and, systemic values include system judgment (the ability to judge order within a system) and self-direction, motivation and persistence. Hartman (1967) further asserts the existence of an hierarchy of value richness, first privileging intrinsic (focus on the good), which is better than extrinsic (focus on comparing one thing to another), which is better than systemic (focus on perfection and rules). Hartman (1967) maintains that people value everything in one of these three ways, or in some combination. The result can be a person experiencing tension amongst the three dimensions of his or her values (in addition to the tension amongst multiple stakeholders with competing values). Bottom line: how a person thinks (assigns value along these three dimensions) will determine how he or she acts in a situation. Proper valuing requires attentiveness to all three dimensions. To illustrate using sustainable consumption, although one may prefer a particular corporation (intrinsic), a balanced attention also includes paying attention to the vendor’s performance according to corporate social responsibly sourcing standards (extrinsic), and its performance in a legal manner (systemic). Transdisciplinarity requires personal involvement in any issue that surpasses disciplinary frontiers (Max-Neef, Elizalde & Hopenhayn, 1989). This personal involvement requires that people are critically aware of their value systems and of the role axiology plays in complex problem solving. People need to respect the role of values if they truly want to understand communication and information sharing (Delgado, 1993), especially in the transdisciplinary methodology, which has such a profoundly different understanding of these two phenomena—communication and sharing of information. Ignoring axiology imperils truly understanding society’s complex problems and their resolution. Horlick-Jones and Sime (2004) concur that transdisciplinary research and understandingis necessary in order to engage with a range of real-world problems. They explain that this transdisciplinary work entails making linkages between scholarship and practice, as well as across disciplinary boundaries and with civil society. They coin the term border-work to refer to the intellectual work that occurs when people living on the borders of the academy and civil society engage in complex problem solving (i.e., transdisciplinary work). Along the same line of thought, Nicolescu (1993) suggests this transdisciplinary work will necessitate perpetual movement across many thresholds. Horlick-Jones and Sime (2004) further recognize that this transborder-work focuses on the emergence of a class of contemporary world problems with a number of common features. Typically, for these problems, the facts are uncertain, values are in dispute, stakes are high and decisions are urgent. In order to address such emergent problems, new forms of scientific activity are needed, characterized by the integration of an extended range of types and sources of knowledge in order to enhance the quality of associated decision-making. This requisite integration of knowledge cannot occur unless values, and their contentious role in problem solving, are duly accounted for. Indeed, if the new entity that is created when diverse minds come together at this border is to successfully understand and integrate information into new learnings and knowings, values have to be respected. Otherwise, the new problem solving entity cannot adequately construct an avant garde, common vocabulary needed for establishing a “new metalevel of discourse” (Klein, 1990, p.66). McGregor (2004) agrees, positing that those engaged in transdisciplinary work need to be able to talk to each other as they engage in emergent, changing relationships. Accounting for the role of values is tantamount to successful transdisciplinary border-work. Burger (2003) refers to values as the steering function in people’s cognitive processes, especially during discovery processes, when new knowledge is being created on transdisciplinary boundaries. He argues that respecting values reduces the traditional separation between the context of discovery and the context of justification. Scientists have traditionally ignored the values that shape human actions simply because these values cannot be fully analyzed from a third-person perspective (Hart, 1971). Burger poses the argument that because being action-laden is directly linked with being value-laden (see Hofkirchner, 2003), the ban on non-epistemic values has to be lifted, else the creation of new knowledge is compromised. For clarification, epistemic values (constitutive values) ‘constitute’ the enterprise of science. Non-epistemic values (contextual values) arise from the social, personal and cultural ‘context’ or environment in which science is done (Odenbaugh, 2003). More creatively, Burger (2003) posits that value disputes, which emerge when different actors are brought together in the knowledge generation process, are a necessary part of steering the thought processes, dependent on the pro and con views of the problem. Dissenting views and attendant controversy often motivate people to think differently about how to solve the problem (e.g., the public debate about climate change). Without a focus on the values inherent in these situations, without a respect for how they steer the thought processes of people, transdisciplinary work cannot be accomplished. Transdisciplinarity needs value-steered processes to lead to multiple truths; its attendant knowledge production depends upon it. The integration of non-scientific expertise, value premises and problem views (civil society, governments and industry sectors) with disciplinary mindsets held in the academy is the cornerstone of transdisciplinary work, necessitating a direct focus on the problem of the historical fact-value dichotomy. Different actors come to the problem with unique sets of preferences and value premises. Transdisciplinary work requires “the axiological [de]reconstruction” of the historical and cultural genesis of respective value sets (Burger & Kamber, 2003, p.54) so people can better relate to each other during their transdisciplinary border-work (Horlick-Jones & Sime, 2004). Burger and Kamber (2003) use the term intra- and extra-scientific to refer to ways of knowing held by those outside the scientific/academic community (“the gathered experiences of laypeople,” p. 63). They argue that transdisciplinary work necessitates that this extra-scientific expertise be legitimized and integrated. But, they do not stop there. They also urge people to integrate heterogeneous and divergent interests and value schemas that people hold about the complex problems at hand. To not do so disrespects the value-laden character of the world’s pressing problems. They refer to this process as the “integration of heterogeneous problem perspectives” (p. 64), and claim the integration of different value systems is necessary in order to generate an adequate spectrum of a scenarios of a well-defined problem. They maintain that scenario building (creating solutions to the complex, emergent problems) is the main cognitive goal in transdisciplinary research and a huge component of this exercise is respect for the steering function fulfilled by values. Most will agree that people enter into transdisciplinary border-work with their own value premises, which have to be reconciled in order for the work to unfold. These values may or may not initially favour transdisciplinary work but hope is held out that, through dialogue, value differences can be mediated to allow for transdisciplinary problem solving. Nicolescu, the father of transdisciplinarity, believes that the transdisciplinary methodology does not require a separate axiom for axiology while others feel that this issue is not yet resolved, that we need to have further conversations about the need for a transdisciplinary theory of values (a transdisciplinary axiology pillar) (e.g., Cicovacki, van Breda, Glasser and Bertea). McGregor (2009, 2010) went so far as to suggest a name for this axiology (integral value constellations) to parallel the three unique names Nicolescu created for the logic of the included middle, Multiple Levels of Reality (and the Hidden Third) (ontology) and complex, emergent knowledge (epistemology). transdisciplinarity or if, as Nicolescu (2006b) suggests, transdisciplinary axiology derives from transdisciplinary logic, transdisciplinary epistemology and transdisciplinary ontology, negating the need for a fourth pillar. No other major research methodology takes this stance. Each of empirical, interpretive and critical methodologies stipulate all four axioms (see McGregor & Murnane, 2010). Because the intellectual and conceptual contributions of Nicolescu’s approach to transdisciplinarity are so profound and intellectually sound, it is, at first glance, tempting to accept his deeply learned assertion that a theory of values is not necessary for transdisciplinarity. Unfortunately, this unconditional acceptance is tantamount to precluding any further discussion of the issue of transdisciplinary axiology. Not comfortable with this possibility, this paper respectfully challenged the assumption that the interactions amongst logic, epistemology and ontology accommodate axiology. Arguably, this assumption leaves too much to chance and has the potential to relegate values to the sidelines. This was not the intent of Nicolescu’s position on transdisciplinary axiology. He does not eschew values in transdisciplinary work; rather, he wants to keep the transdisciplinary methodology simple (elegant and parsimonious). In his words, “Any axiom which can be derived from the already postulated ones, has to be rejected” (2010a, p.3). If A is simpler than B, it is rational (other things being equal) to use A. As well, if A is simpler than B, it is rational to use A as one’s working theory or approach (Baker, 2010). Nicolescu believes transdisciplinary methodology is simpler (yet just as rigorous) minus a fourth pillar for axiology. Indeed, a powerful methodology is the desired end, especially one that is simple. The simplicity principle comprises two facets: elegance and parsimony. Elegance refers to the number and conciseness of a theory’s basic principles. Parsimony refers to the number of kinds of entities being postulated (Baker, 2010). 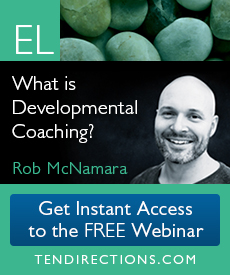 A simple approach has minimal concepts, is straightforward, and is more likely to be internally consistent. Presumably, the relative simplicity of one less axiom means the transdisciplinary methodology is more likely to lead to unambiguous and unequivocal scholarship and problem solving. Yet, what makes parsimony reasonable in one context may have nothing to do with another context (Sober, 1994). Is it reasonable to assume we do not need a transdisciplinary theory of values, when all other contending/complementary methodologies accommodate values? transdisciplinary theory of values. Appeals to parsimony always depend upon assumptions for their rational justification (Baker). Nicolescu focused his intellectual energies upon developing three transdisciplinary axioms (logic, epistemology and ontology), but not axiology. At issue is whether we can unconditionally accept Nicolescu’s (2010a) rational justification that a theory of values is not necessary because transdisciplinary values intuitively stem from the Hidden Third (ontological), the interaction among people holding different value premises, perceptions and perspectives. We cannot forget that epistemological and ontological choices always involve aspects of axiology (values) (Engle, 2009), whether acknowledged or not. On another methodological front, there has been no discussion in transdisciplinary discourse about what constitutes a transdisciplinary value, whether transdisciplinary values are different from stakeholders’ value schemas, or of how transdisciplinary and the latter values are related (precursor, proxy, catalyst, distinct). That discussion seems to fall directly within the remit of a transdisciplinary theory of values (axiology) as do other questions. By what manner do people develop, assert and believe in certain values and act or fail to act on them? How do these values change or become more entrenched, especially during the solution of complex, wicked human problems? By what manner do popularly held group values (especially specific stakeholders and interests) change under particular conditions? How are these two facets of values (individual and group values) played out in transdisciplinary problem solving, relative to disciplinary-specific or non-academic settings? What processes are involved in a field of values that are (re)produced, negotiated and transacted in the context of creative, complex problem solving? The list of pressing, value-oriented questions for transdisciplinary axiology is endless but may not be adequately addressed if we do not add a fourth pillar dealing with the theory of values. It makes intellectual sense that value clarification and reconciliation will happen within the Hidden Third, and that this value emergence and integration process may or may not lead to distinct transdisciplinary values. But, by not explicitly naming a fourth axiology, Nicolescu runs the risk of people not appreciating the powerful role he sees for values in transdisciplinary work. 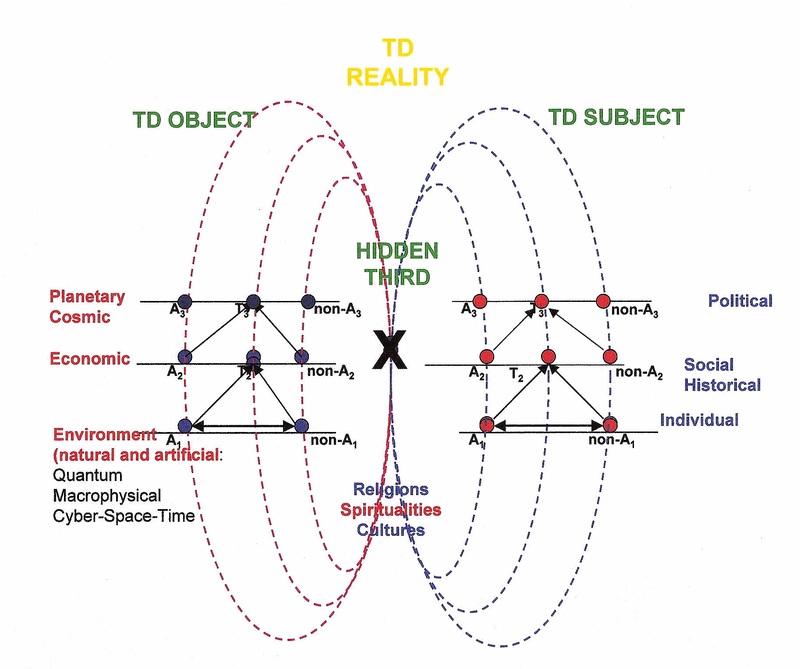 To confound matters, he asserts that ontology is the least understood axiom of transdisciplinarity, where the construct of the Hidden Third is housed and where transdisciplinary values allegedly are engendered (Nicolescu, 2010b). This begs the question—if people cannot readily embrace or understand transdisciplinarity ontology (from which axiology supposedly derives), how likely are they to ever engage with axiology at all? This possibility may unintentionally disrespect the value-laden character of the world’s pressing problems and deeply compromise their resolution, or lead to insufficient solutions. 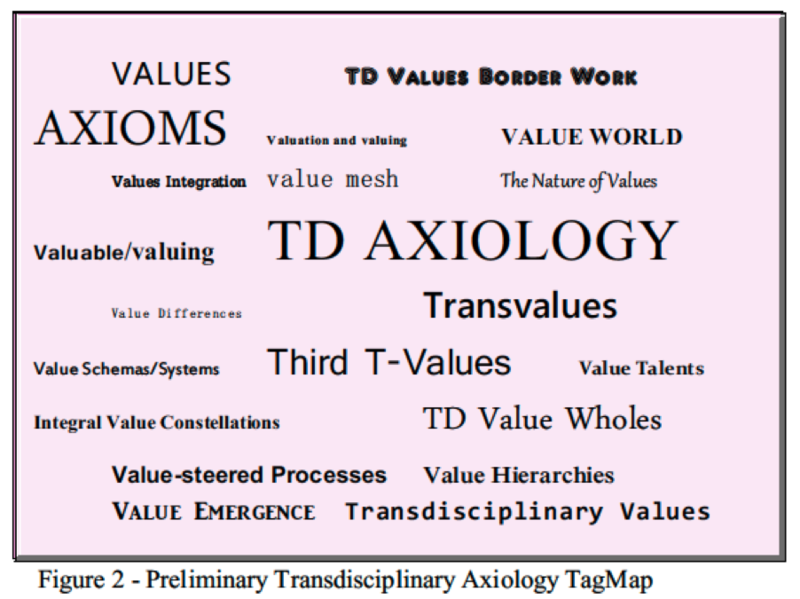 Figure 2 (a rudimentary TagMap) summarizes some of the value- and axiology-related concepts that emerged from this discussion of transdisciplinary axiology. There does seem to be fodder for further discussion of a theory of values for transdisciplinary (an axiology), including discussions of relevant concepts and how they are related. Drawing on John Dewey (1859-1952), Hart (1971) suggests that if a theory of values (an axiology) is not available to afford intellectual assistance on forming ideas and beliefs about values, ideas and beliefs that are adequate enough to direct actions, other things tend to take the place of the intelligence. These other factors include prejudice, self-interest, traditional customs, historical institutions and/or the pressure of the immediate circumstances. By extension, the argument could be made that if the transdisciplinary methodology does not articulate a clear axiology (a theory about values and their role in transdisciplinary work), the solution of pressing complex human problems could be compromised. Finally, it seems appropriate to note that Nicolescu (2002) calls on people to rethink everything in terms of what quantum physics has shown them about the nature of the universe, and to use these insights to inform their approach to solving complex problems facing humanity. In particular, quantum physics teaches us that multiple levels of reality are accessible to people due to their multiple levels of perception of the world (involving values). It teaches us that it is impossible to predict the trajectory of anything because that thing is an inherent part of reality (including values). Between two points there is a gap of potentialities (the quantum vacuum) deeply informed by value premises. All levels of reality experience ongoing interactions among entities, including value exchanges and mediation (McGregor, 2011). Quantum physics also teaches us that people can become open to other points of view, including value schemas. It holds that complex phenomena (like human interactions informed by value constellations) have emergent properties, are always evolving. Finally, quantum physics posits that opposites cannot be separated from each other; especially, facts cannot be separated from values (McGregor, 2011). Perhaps we can better reconcile these powerful insights from quantum physics, the core of the transdisciplinary methodology, by explicitly conceptualizing transdisciplinary axiology, or at least facilitating a wide-ranging dialogue about the merit of the idea. The theory of values (axiology) designates the area of philosophy that is concerned with theoretical questions about values and with investigations that explore issues related to values of all varieties in many contexts (Schroeder, 2008). Why should we disadvantage ourselves of this aspect of transdisciplinary scholarship? I invite others to join this conversation. Bahm, A. J. (1993). Axiology: The science of values. Atlanta, GA: Rodopi Press. Baker, A. (2010). Simplicity. In E. N. Zalta (Ed. ), Stanford Encyclopedia of Philosophy. Banathy, B., & Jenlink, P. (2004). Systems inquiry and its application in education. In D.
Bindé, J. (Ed.). (2004). The future of values. Paris, France: UNESCO. Burger, P. (2003). Non-epistemic values and scientific knowledge. In W. Löffler and P.
(pp. 67-70). Kirchberg, Austria: Austrian Ludwig Wittgenstein Society. Burger, P., & Kamber, R. (2003). Cognitive integration in transdisciplinary science. Issues in Integrative Studies, 21, 43-73. Delgado, R. R. (1993). 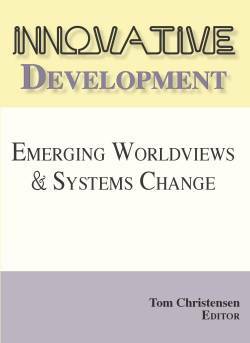 The application of systems thinking to the design of educational systems. In C. Reigeluth, B. Banathy and J. Olson (Eds. ), Comprehensive Systems Design (pp. 225- 237). New York: Springer. Engle, E. A. (2009). Ontology, epistemology, axiology. Appalachian Journal of Law, 8(1), 103-122. Funtowicz, S., & Ravetz, J. (2008). Values and uncertainties. In G. Hirsch Hadron, et al. (Eds. ), Handbook on Transdisciplinary Research (pp. 361-368). the Netherlands: Springer. Hart, S. L. (1971). Axiology: The theory of values. Philosophy and Phenomenological Research, 32(1), 29-41. Hartman, R. S. (1967). The structure of value: Foundations of scientific axiology. Carbondale, IL: Southern Illinois University Press. Hofkirchner, W. (2003). A new way of thinking and a new world view. In V. Arshinov and C. Fuchs (Eds. ), Emergence, Causality, Self Organization (pp. 131-149). Moscow: NIA – Priroda Publishers. Hunsinger, J. (2008). Series introduction. In N. Sunderland, P. Graham, P. Isaac and B. McKenna (Eds. ), Transdisciplinary Studies: Toward Humane Technologies (pp. 11-14). The Netherlands: Sense Publishers. Klein, J. T. (1990). Interdisciplinarity. Detroit, IL: Wayne State University Press. Max-Neef, M., Elizalde, A., & Hopenhayn, M. (1989). Human scale development. Development Dialogue, 1, 5-81. McGregor, S. L. T. (2010). Consumer moral leadership. the Netherlands: Sense Publishers. McGregor, S. L. T. and Murnane, J. (2010). Paradigm, methodology and method: Intellectual integrity in consumer scholarship. International Journal of Consumer Studies, 34(4), 419-427. McGregor, S. L. T., and Volckmann, R. (2011). Transversity. Tucson, AZ: Integral Publishers. Nicolescu, B. (1993, October 4-8). Towards a transdisciplinary education. Paper presented at the Education of the Future Conference. São Paulo, Brazil. Nicolescu, B. (2002). Manifesto of transdisciplinarity [Trans. K-C. Voss]. NY: SUNY. Nicolescu, B. (2005). Transdisciplinarity: Theory and practice. Cresskill, NJ: Hampton Press. Nicolescu, B. (Ed.). (2008). Transdisciplinarity: Theory and practice. Cresskill, NJ: Hampton Press. Engineering and Science, 1(1), 19-38. Nicolescu, B. (2011). Transdisciplinarity: The Hidden Third, between the subject and the object. In I. Chirila? and P. Bud (Eds. ), Atiina, Spiritualitate, Societate [Science, Spirituality, Society] (pp. 11-34). Cluj-Napoca, Romania: Eikon Publishing House. Odenbaugh, J. (2003). Values, advocacy and conservation biology. Environmental Values, 12(1), 55-69. Sober, E. (1994). From a biological point of view. NY: Cambridge University Press. transdisciplinary science. Nicotine and Tobacco Research, 5(1) [Supplement], S21-S39. Communities, Multicultural Practice (pp.67-88). Turku, Finland: University of Turku. Torkar, G., & McGregor, S. L. T. (in press). Reframing the conception of nature conservation management by transdisciplinary methodology: From stakeholders to stakesharers. Journal for Nature Conservation. Zierhofer, W., & Burger, P. (2007). Disentangling transdisciplinarity. Science Studies, 20(1), 51-74.